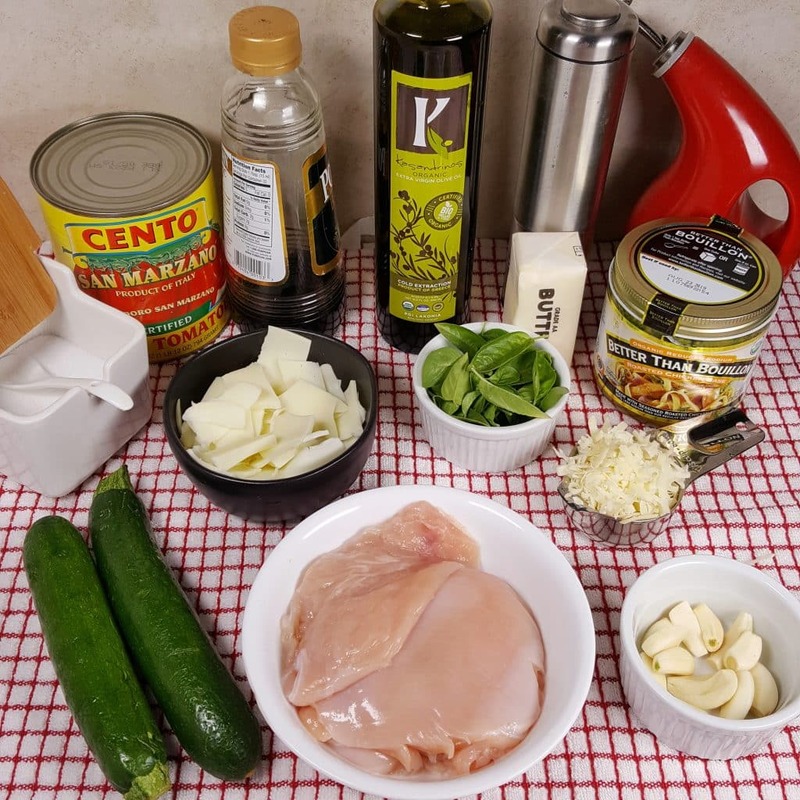 Pressure Cooker Bruschetta Chicken with Zoodles is a dump and push, Low Carb, Gluten Free, Keto meal that tastes like a million bucks. I am dieting. Whether it be Low Carb, counting calories, Keto, Weight Watchers, I need to lose weight. 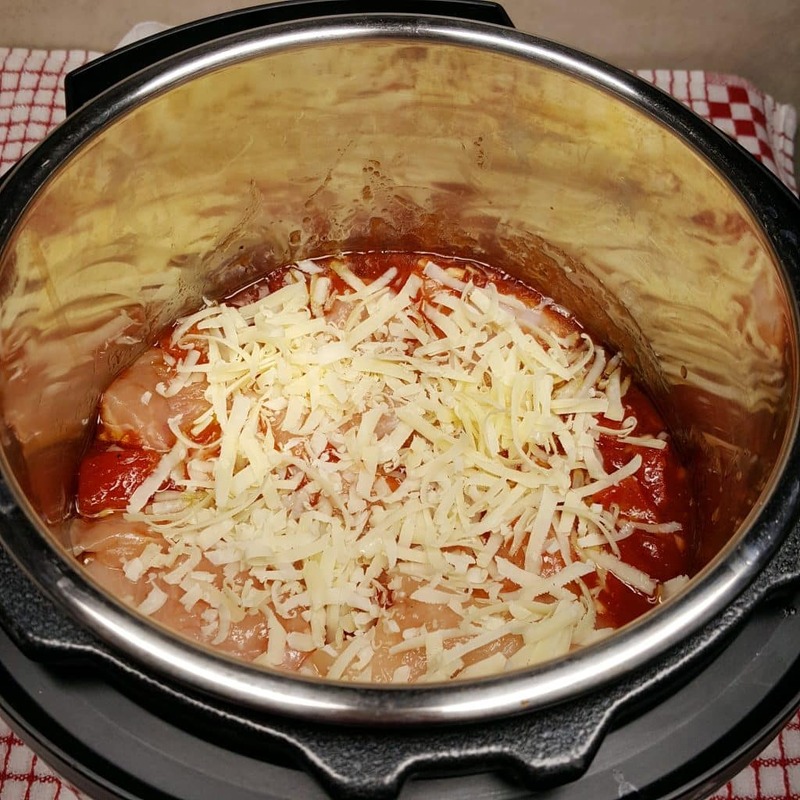 My Instant Pot DUO Plus 60 will be very valuable in my weight loss journey. I promise that the flavor and ease of cooking will remain my top priority. This Pressure Cooker Bruschetta Chicken with Zoodles has been a labor of love and has gone through many incantations. There are a few issues. No protein, lots of oil and very high carbs. 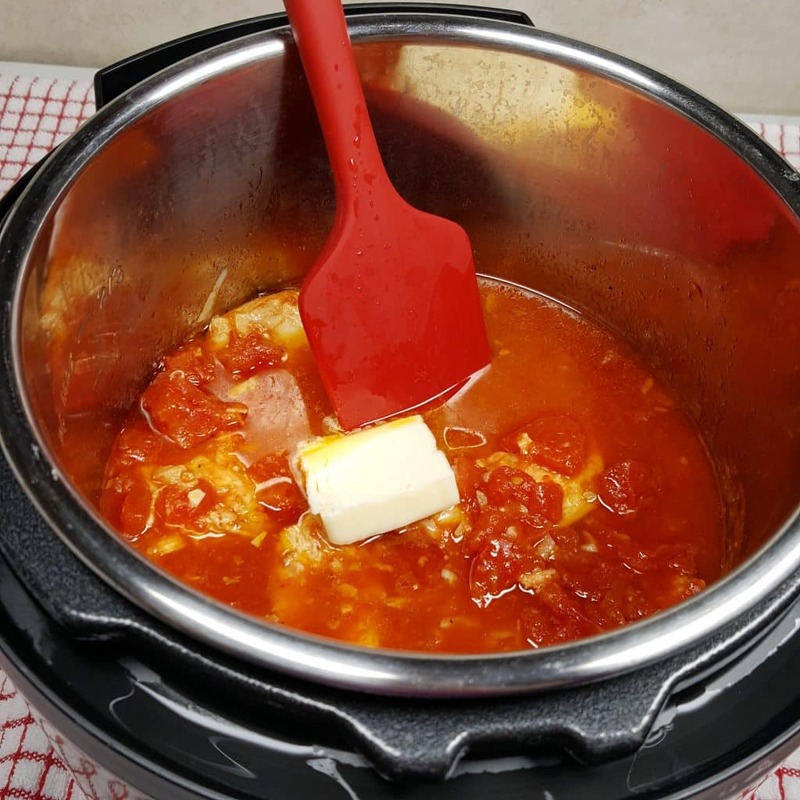 My version of Bruschetta in the Instant Pot DUO Plus 60, needed to be delicious, while maintaining the high level of flavor my readers expect from my This Old Gal Blog. My Pressure Cooker Creamy Tuscan Garlic Chicken has been the number one Chicken recipe on the Blog. Let’s see if this recipe can break the record. There is so little effort and such a big taste. *** Make sure NOT to use the grated/powdered stuff that comes in a green can or any other grated/powdered stuff. Use a block of real Parmesan cheese and shred it yourself!!! What are the ingredients for Bruschetta Chicken? How to make and cook Bruschetta Chicken. You are not going to even need a Mixing Bowl, as the ingredients will get mixed right in the cooking pot. The Kassandrinos Olive Oil is a really good Olive Oil and priced right. Give the Olive Oil, Diced Tomatoes, Fresh Garlic, Balsamic Vinegar, Red Onion, Salt and Pepper a quick mix. After the Olive Oil, Diced Tomatoes, Fresh Garlic, Balsamic Vinegar, Red Onion, Salt and Pepper are mix together, add in the Chicken. Lightly pound the Chicken, so that the Breasts are all about the same thickness. Add the Freshly SHREDDED Parmesan Cheese (remember, a block of real cheese, not from a can) on top and you are ready to cook!!! What goes with Bruschetta Chicken? If you are not low carbing it, try my Instant Pot Yogurt Whey Crusty Bread! The Country Sourdough Bread is pretty fantastic too. But since this is a low carb recipe, how about starting out the meal with Pressure Cooker Low Carb Hot Onion Dip? While the Bruschetta Chicken is cooking, grab your Veggie Spiralizer. And a couple of Zucchini Squash. It’s that easy and only takes a minute. My manual hand held Spiralizer gets the job done, just not as fast. This Oxo Spiralizer does a better job. For the full flavor and nutrients, keep the skin on the Zucchini. I mean, obvi, no one peels Zucchini! 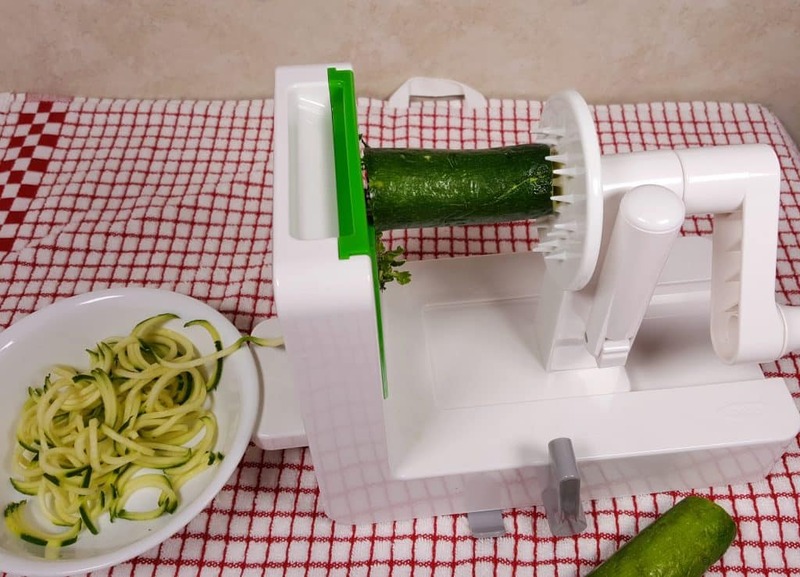 This Veggie Spiralizer comes with several blades, so you can choose the size of your Zoodles. I like to use the Spaghetti blade. My other half, won’t touch the stuff, so I made just enough for me. The Pressure Cooker Bruschetta Chicken with Zoodles recipe is really good with Pressure Cooker Spaghetti Squash. 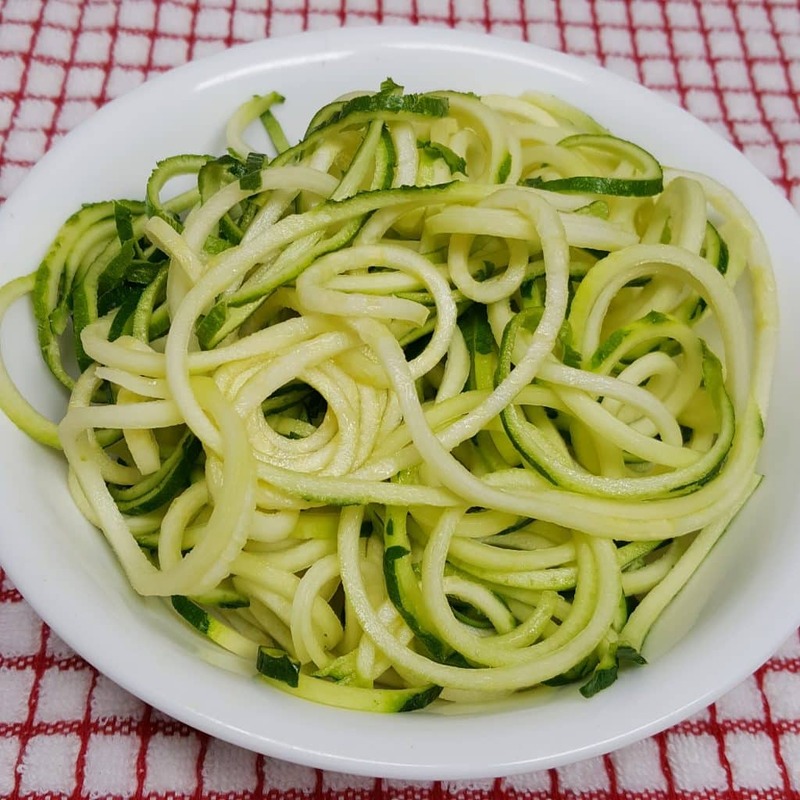 The Zoodles can be used raw, so that is an advantage if you are in a hurry. What I love about this recipe, besides it being so simple and quick, is the versatality. You can change it up a bit for other textures and flavors. If you want to add some richness, a bit of Butter will do just that. For a Creamy Sauce, swirl in some Heavy Cream to the cooking pot. For a change from Zoodles, try my Pressure Cooker Mashed Turmeric Cauliflower. OMG, the Bruschetta Chicken Sauce mixed with the Mashed Cauliflower is incredible. It’s almost decadent. We have very fragrant Basil plants outside. The Fresh Basil adds such aroma and freshness to this dish. If you want to warm up the Zoodles and give them a bit of a steam, add them right into the pot and stir. The residual heat will cook them in about 30 second to the perfect tenderness. I tend to just use them raw. Probably because I cannot get Ed to even taste Zoodles, so I am used to just making the Zoodles and plating them raw. Another super healthy recipe to try is my Pressure Cooker Americana Wedding Soup. 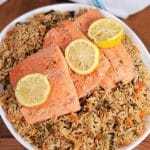 It is filled with so much flavor and is also Low Carb! You won’t miss the potatoes with my secret ingredient taking the place. Let me know what you think. Low Carb Pasta de Bocaditos Jamon – no, it is not pasta, it is a Cuban Ham Spread that is yummy with Pork Rinds. 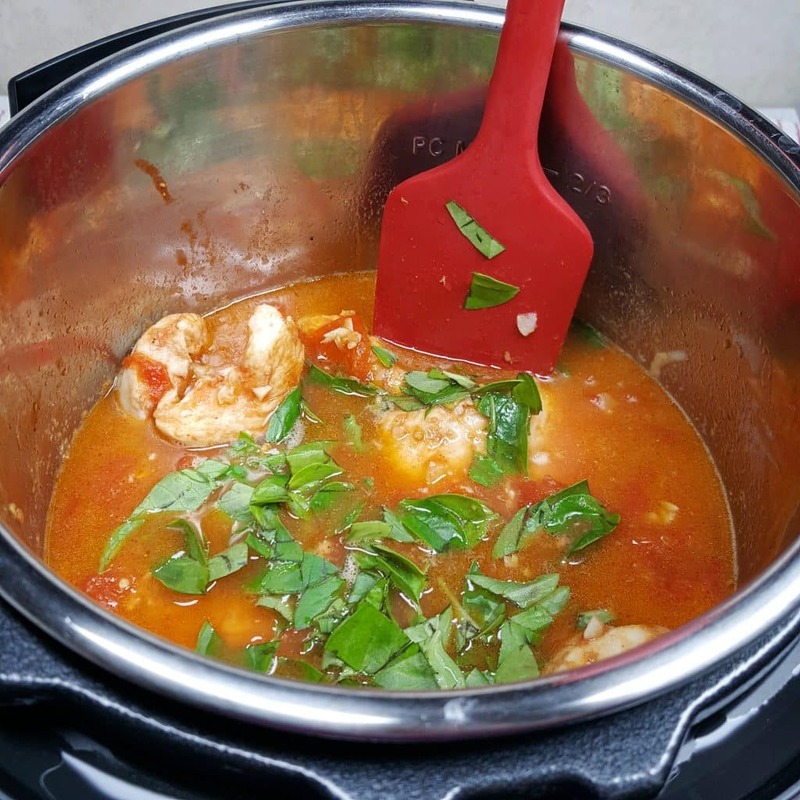 Pressure Cooker Low Carb Manhattan Clam Chowder – One of the best you will ever taste. Pressure Cooker Creamy Tuscan Garlic Chicken – The number on recipe on the blog, 2.5 years running! 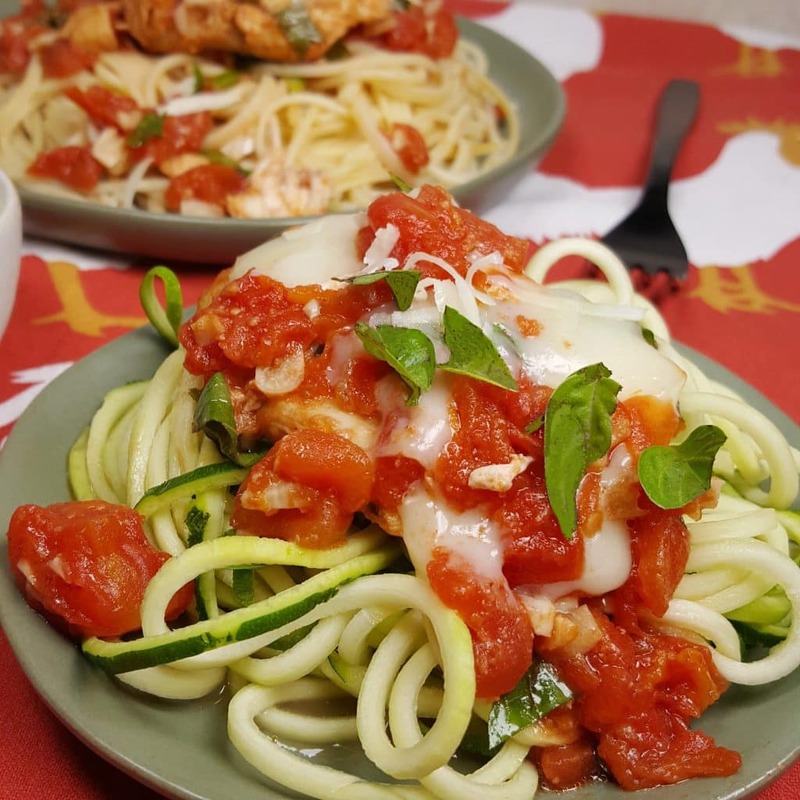 Can you smell this Instant Pot Bruschetta Chicken with Zoodles through your monitor? Do you think you are in a fine Italian restaurant? The hot and yummy Bruschetta will melt the Mozzarella to perfection. No need to turn on the Oven or Air Fryer. Well, if you want to kick this up a notch, make some of my Air Fryer Radish Hash Browns. Crumble them on and sprinkle on top of the Bruschetta Chicken. Now THAT would be delish. Pay no attention to that Pasta behind the Curtain Zoodles. Let me know if you make this recipe! I would love to see a photo! Tag me at #this_old_gal on Instagram! 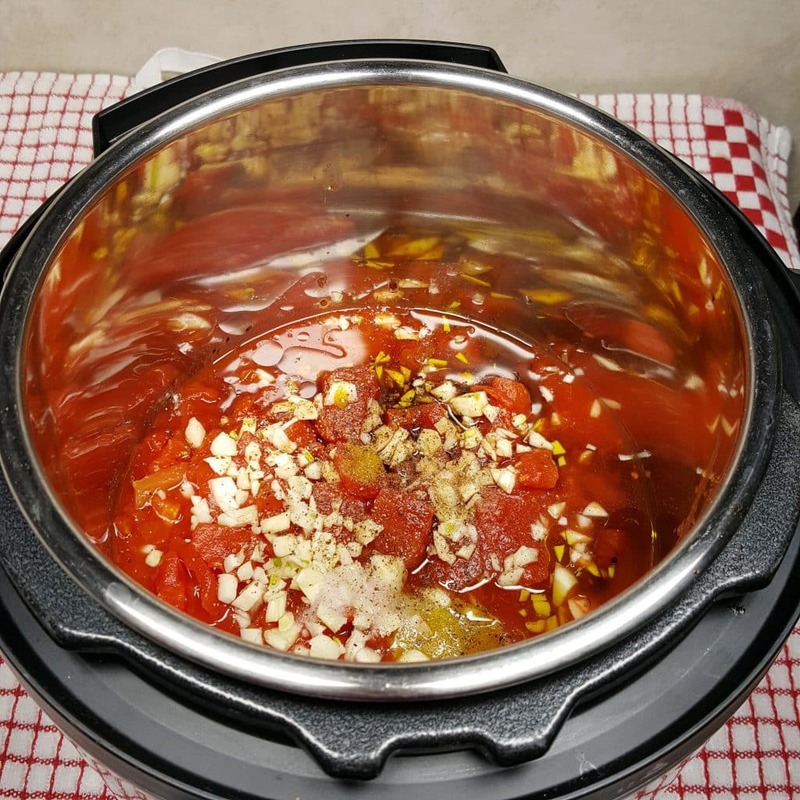 Add Tomatoes, Garlic, Onions, Oil, Chicken Base, Vinegar, Salt and Pepper to Pressure Cooker cooking pot and mix together. Add Chicken and Parmesan Cheese. Lock on Lid and close Pressure Valve. Cook at Low Pressure for 3 minutes. When Beep sounds, allow a 5 minute natural pressure release. Open lid and mix in Butter (if using) and Fresh Basil. 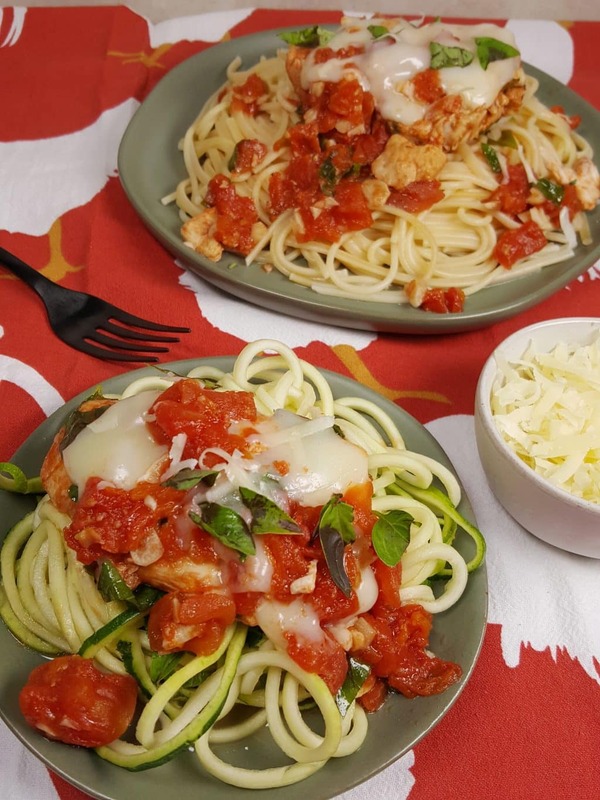 Place Chicken on Zoodles or Pasta. Lay Mozzarella Cheese over Chicken and spoon Bruschetta over Chicken. Grab a block of Parmesan or Asiago Cheese and shred it yourself. The ingredient in the recipe is NOT that green can of the powered/grated stuff. Use as many Tomatoes as you like! Use 2 Tablespoons of Butter for richer flavor. Use 1/4 cup of Heavy Cream for a Creamy Bruschetta Chicken. Love yoir new keto low carb dishes, we all need to lose weight and eat healthier! Thanks, please keep it up! My assumption is that the 3 TBL chicken base is diluted with 3 cups of hot water. Correct? I have this same question! It appears that there is no liquid in the recipe? Could we sub chicken stock if we have no bullion on hand? The recipe is correct as written. Is that time correct..3 minutes? I thought 6-8 minutes for chicken breast? Jill, I made it last night and we all liked it. I do have a couple questions: 1. When do you add the basil? 2. What do you think about adding a little quinoa? If doubling the recipe, will I need toads time to cook? I made this tonight with frozen chicken tenders. My hubby, who usually never tells me if he likes something, actually said it was good! We both enjoyed it. Thank you for another delicious meal idea! I tried it it was yummy the second time I used salsa in place of the diced tomatoes and I used Mexican cheese in place of the parmessan cheese. I am Going to make this tonight but i want to use canned tomatoes. How many cans are equivalent? And do i drain them? How thin are you pounding your chicken breasts in order to cook them in 3 minutes? This was awesome! I sautéed my zooodles in a bit of oil and did a half recipie of the chicken bruschetta. Hubby and I both loved it! How many cans of diced tomatoes equals 2.5 pounds? What’s the net carb count for this? I can’t seem to find it anywhere in your nutrition facts. Jill, I’m going to several others here and ask: Where are the Nutritional facts? I am on the KETO diet and carb count is very important. This recipe sounds really good and I would like to it but not without knowing the carb count.